If you're self-conscious about your smile because of cracked, broken, decayed or worn teeth, we can bring back your healthy, beautiful smile with a custom-made crown. 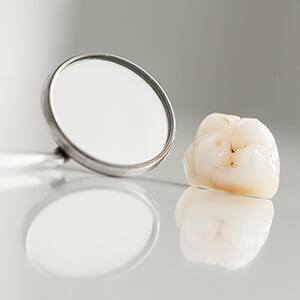 A filling can restore a small defect in a tooth, but a crown is the most durable and strongest way to restore a front or back tooth with extensive damage for the long term. And, with all the materials and techniques modern dentistry has to offer, you can enjoy natural-looking results. In addition to restoring a single tooth, a custom-made crown can also correct bite problems, close spaces between teeth, and change the alignment of crooked teeth. And, when combined with a bridge or a dental implant, they can even be used to replace a tooth you may have previously lost. Your crown will be customized to match shape and shade of your existing teeth. What’s more, many of today’s crowns are made metal free, so the porcelain reflects light the same way real enamel does. As a result, your finished restoration will blend in with your surrounding teeth, giving you a fully restored tooth that looks natural. To learn more or schedule an appointment, please contact us today.